I was in the second grade in 1956 and so wasn't paying attention when Love Me Tender opened in theaters around Thanksgiving time that year. It wasn’t until six years later that I first saw Elvis’s debut movie when it aired on TV. Having previously seen several of Presley's later movies in the early 1960s, Love Me Tender seemed then a rather odd Elvis film to me. 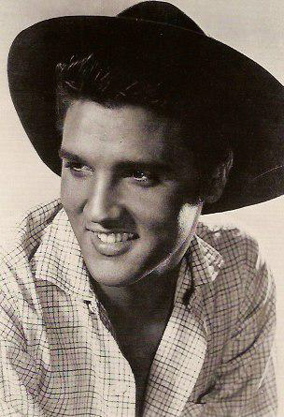 First of all, it was a traditional Western, one of only three Elvis would make. (Flaming Star and Charro! were the other two.) It was also the only movie in which Elvis played second banana. Oh sure, he received top billing, but in the film itself he was clearly a supporting actor to Richard Eagan's lead. In fact, it was 20 minutes into the film before Elvis made his first appearance, trudging along behind a horse and plow. In retrospect, it's obvious that Twentieth Century Fox was uncertain whether to feature Elvis in the film as a singer or as an actor. So they tried to have it both ways. 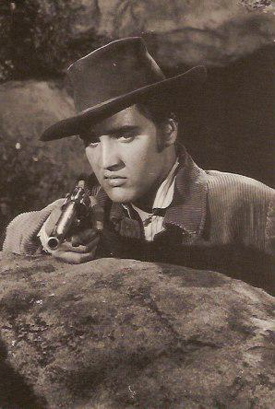 As Clint Reno, Presley had a dramatic role as a hot-headed, jealous husband. Hedging his bet, however, director Robert Webb inserted four songs, all in a short window in the middle of the film. "Love Me Tender," performed on the porch of the Reno ranch house, somewhat fits the time period. While Elvis's fans no doubt loved them, however, the shaking shoulders and swiveling hips as Elvis sang the other three numbers ("We Gonna Move," "Let Me," "Poor Boy") seem ridiculous in a film set in 1865. But then, the film's obvious goal was to capitalize on Elvis's exploding popularity as an exciting stage performer. Variety acknowledged as much in its November 21, 1956, review of the movie. "For the benefit of the hordes of teenagers who’ve made a national figure of rock 'n' roll singer Elvis Presley and who’ve been buying his RCA Victor platters by the millions, Twentieth-Fox has whipped up a minor league oater (and oncer) in which to showcase one of the hottest show biz properties around today." That being the case, Variety's reviewer didn't spend much time evaluating Elvis's acting ability: "Appraising Presley as an actor, he ain’t. Not that it makes much difference. The presence of Presley apparently is enough to satisfy the juve set." While watching the film recently, I was struck by Elvis's voice as he delivered his lines. His high-pitched, strident, sometimes hayseed, tones stood out in contrast to the measured voices of his more experienced fellow actors. In analyzing the cast, Variety at least gave Elvis credit for enthusiasm: "Eagen is properly stoic as the older brother, while Miss Paget does nothing more than look pretty and wistful throughout. Mildred Dunnock gets sincerity into the part of mother of the brood, an achievement. Nobody, however, seems to be having as much fun as Presley …"
As simple as Love Me Tender is, however, it had a major impact on the future Hollywood career of Elvis Presley. Because of his presence in it, the movie was considered a "juve" film, since it expected to draw a primarily adolescent audience. It was for that reason that it opened over the Thanksgiving weekend, when teenagers would be out of school a couple of extra days. When Elvis came along, "juve" movies were rare in Hollywood. The major studios believed that the teenage crowd, even if it came out in force for a film, would not be strong enough to fill the theaters, especially for evening showings during the week. With the cost of making movies rising, studio execs had been reluctant to take on risky "juve" projects. 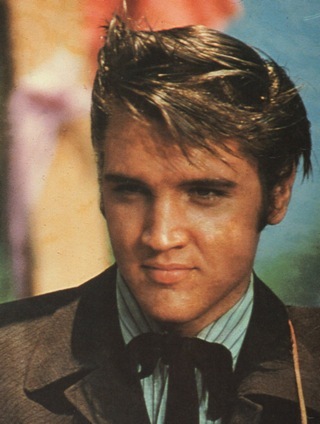 Twentieth Century Fox decided to take a chance with Presley, however, because it felt the low-budget Love Me Tender would clean up with the teenage crowd and draw some adults as well. 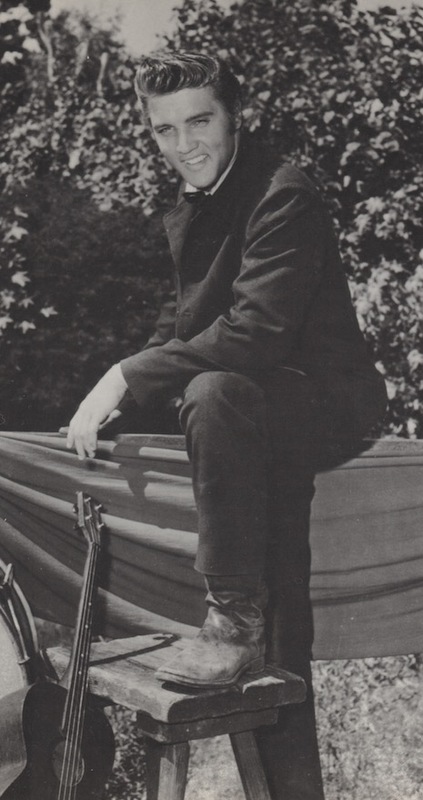 According to a Variety article a month before the film opened, "Twentieth figures there’s a good deal of curiosity value in Presley among the older folks." There was another reason Hollywood was willing to take a shot at "juve" films in the mid-fifties. 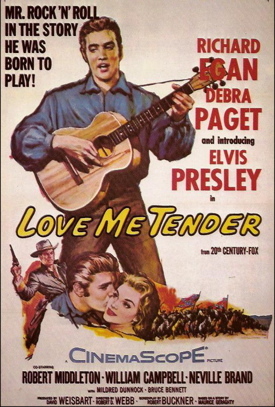 On the day Love Me Tender opened nationwide, Variety reported a feeling in the film industry that, "the return of the films with juve appeal is an absolute necessity if the young audience is to be weaned away from the tv sets." 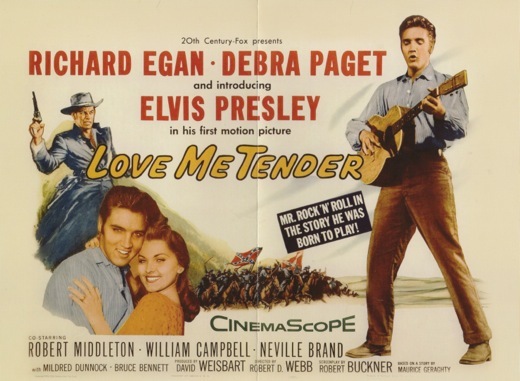 What happened during the first week that Love Me Tender was in theaters changed the industry's attitude about films aimed at teenagers. "We did two weeks' business in one," a Twentieth Century exec told Variety. The adults stayed away, but Hollywood learned that if the incentive was there the teenage crowd could fill the theaters and put a movie over the top. According to Variety, the industry then started "to develop players and subject matter to bring out the juvenile audience sector." 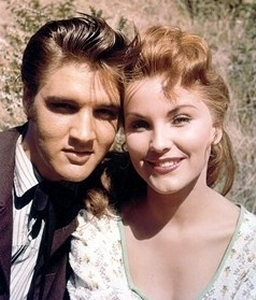 In this respect, Elvis and Love Me Tender opened Hollywood's door for other rock 'n' roll entertainers. "Twentieth Century Fox was uncertain whether to feature Elvis in the film as a singer or as an actor. So they tried to have it both ways."